What a lovely layout and memory! Love your color choices and the vintage pattern embellishment. thanks so much for sharing with us at TAAFOMFT. Beautiful picture!! You look gorgeous in your blue dress! I love the flowers and the vintage card! Thanks so much for joining us at TAAFOMFT! 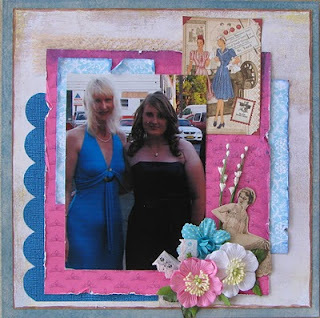 What a beautiful layout!Lving that picture of you and your daughter!Loveing those vintage images and your design..that netting,those flowers and the colors!Thank you so much for joining us at Fave Things! Awww! You two look so pretty! Great layout -- I love how my eyes are drawn to the lovely pic! Oooh, and that lovely bit of vintage in the top right corner! Thanks so much for joining us again! Love to Scrap... why isn't there more hours in a day ! !